CraftHaüs Design creates & produces engaging events that excite, inform and inspire. For 20+ years, we have developed global gatherings ranging from exclusive FORTUNE 500 executive thought-leadership symposiums to best-in-class culinary, arts & music festivals enjoyed by thousands. Whether in business or in our personal lives, human interaction is a powerful instrument to enrich our world. Through it, we are able to prosper as a group and grow as individuals. CraftHaüs Design’s newest series of “Music, Eats & Arts” cultural festivals will feature incredibly talented musical artists, regional & global cuisine, plus an artisan marketplace with exquisite handcrafted goods & artworks. Kicking off August 2019 in the historic & newly trendy Kingston, NY on the breathtaking shores of the Hudson River, these festivals are sure to be magical experiences for the mind, body & soul. After creating BrüFrou in 2014, CraftHaüs Design grew the event to be the largest craft beer + culinary pairing event in the country. The expanded & renamed BrüFrouFEST, featured 120 local brewers & top chefs collaborating on over 80 unique pairings. For 5 years, BrüFrouFEST's "best in class" approach excited the epicurean senses of over 9,000 attendees, and in it's most recent year, we added music to the mix with national bands from coast to coast: The Mowgli's, Zach Deputy, Horseshoes & Hand Grenades, plus a handful of local artists. Working in concert with Cisco's core event team, CraftHaüs helped produce 20 Cisco executive conferences. Below is an overview of the 3 main gatherings and the tasks we handled. [A] The annual event provides a meaningful opportunity for 125 North American FORTUNE 1000 CIOs at Cisco’s largest annual IT and communications conference. Participants huddle with the Cisco executive team and peers around the technology solutions & imperatives of today’s rapidly changing global economy. [B] Created for a select group of 100 Global FORTUNE 500 CIOs from across the world, the annual event connects industry leaders through a series of interactive discussions and problem-solving workshops. The sessions are designed to foster conversations around the intersection of business & technology. [C] Bringing together 75 CEOs from Global Fortune 250 companies, along with their CIOs, the biennial event is rich with opportunities to collaborate and discuss the most timely and transformative issues facing today's leaders. Located at the Accra International Conference Center in Ghana, the public & private sector-led event helped drive investment into projects addressing food security by bringing together 1,200 key stakeholders including: African & global business leaders, Grass roots organizations & African farmers, Heads of State & government ministers and Social entrepreneurs & leading philanthropists. The AGRF was built on the successes of previous African Green Revolution Conferences held in Oslo, Norway. Equinix is the world's largest IBX data center & colocation provider, offering the fastest application performance, lowest latency routes worldwide and a digital ecosystem for financial, content or rich-media, enterprise, and cloud networks. We worked in concert with the core events & marketing team to develop these exceptional gatherings. [A] The annual 600 person event gathered Equinix's executive team & top performing sales teams from around the globe. Team members were culled from the Americas, EMEA & APAC regions to experience main stage speakers, team huddles & educational team-building games & exercises that focused on cross-regional learnings. 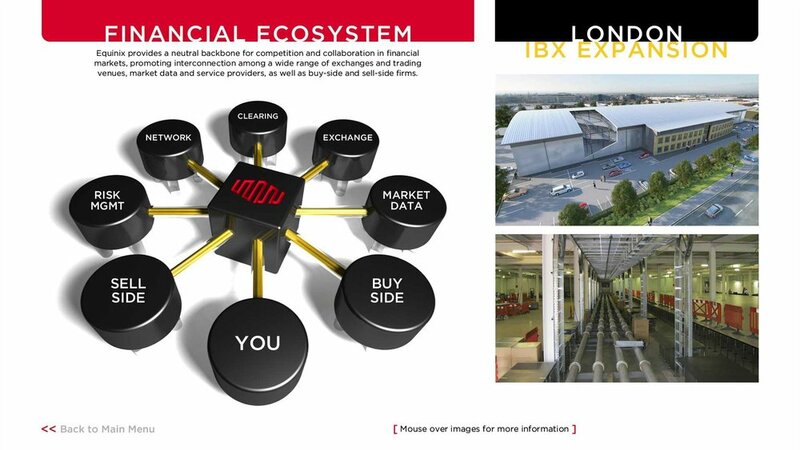 [B] One day event designed to educate & inform 200 investors & analysts about Equinix’s successful ecosystem strategy and what ensures Equinix’s customers loyalty. We developed various kinds of attendee interactions to engage the investor & analyst audience including: interactive kiosks, main stage programatic sessions & one-on-one breakouts.